You are looking for a recruitment consultant. You may be a business looking to recruit staff or someone looking for a career move, so what process will you be going through? Personal recommendation? Industry specialists? The web? Almost certainly a combination of all three, but whatever route you adopt, one thing is for sure, at some stage in the process you will be conducting an online search. ...and what do we see? 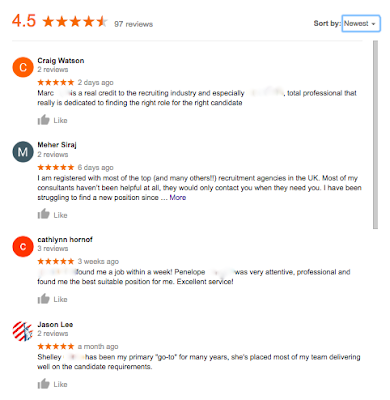 We see a massive opportunity for any recruitment consultant that succeeds with Google reviews to stand out like a beacon. But before we go ahead and examine that opportunity in detail, let's first pause and consider why reviews matter for recruitment and then why recruitment has not - yet - engaged. ...so why, assuming they do a decent job for the majority of their clients and applicants, do they allow this impression to persist in search? The answer is almost certainly twofold. 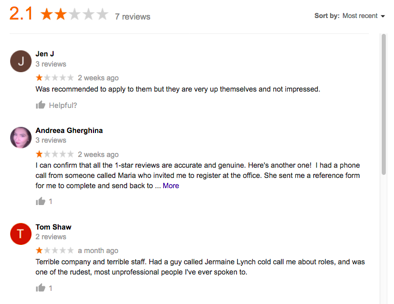 First: ignorance - you might be surprised just how many businesses we meet that are unaware of their image in search, they simply didn't know they looked so bad (and nor, in the majority of cases, did they know that they could respond to their reviews). The second, and this is more common than many people think, is fear. Fear of opening their business up to (even more) criticism. ...it's the same business. The only difference is that they have engaged with Google reviews. 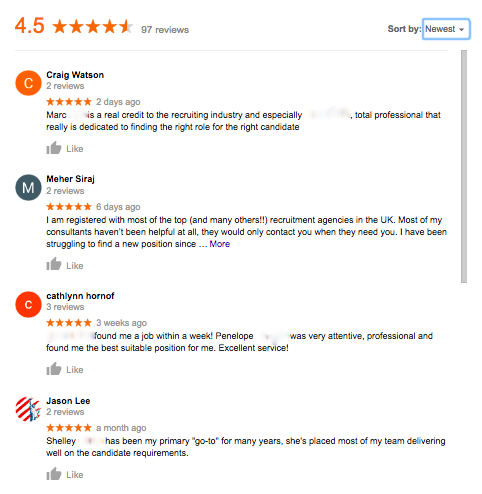 As you can see, from the screenshots above and from any search for 'recruitment consultant' wherever you may be - recruitment consultants that have not engaged with Google now show poorly, often very poorly indeed. 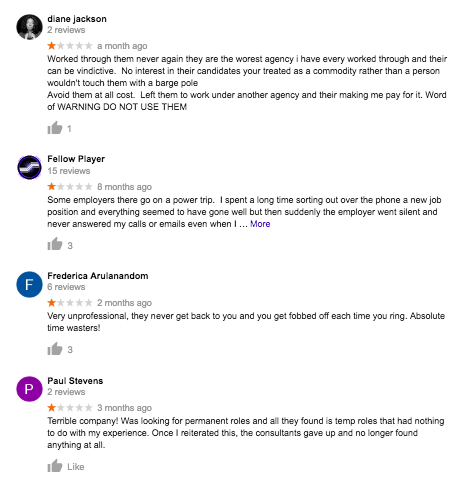 In some cases this may be deserved, but in over ten years' experience as review managers we usually find that unengaged businesses look far worse in search than in reality, simply because 'not engaging' as a strategy allows disgruntled reviewers a free run at the business in question's online reputation. All that needs to happen in the overwhelming majority of cases is a determination to address the issue by the business concerned combined with the support of a professional review manager like HelpHound. ...determines to invite its stakeholders to post reviews. It's as simple as that. ...provides moderation. Not to deflect genuine negative reviews - that would be against the CMA regulations* - but to enable the business and the reviewer to engage in a dialogue before the review is published should the review in question contain factual inaccuracies or the potential to mislead readers. And to mitigate the 'fear'. We also provide the software to enable the business to invite the reviews to the business's own website and then get them copied across to Google by the reviewer.